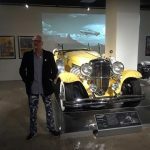 When we arrived at the Petersen Automotive Museum, it was raining cats and dogs, but I was excited because we were meeting with artist, musician, and writer Anthony Ausgang. 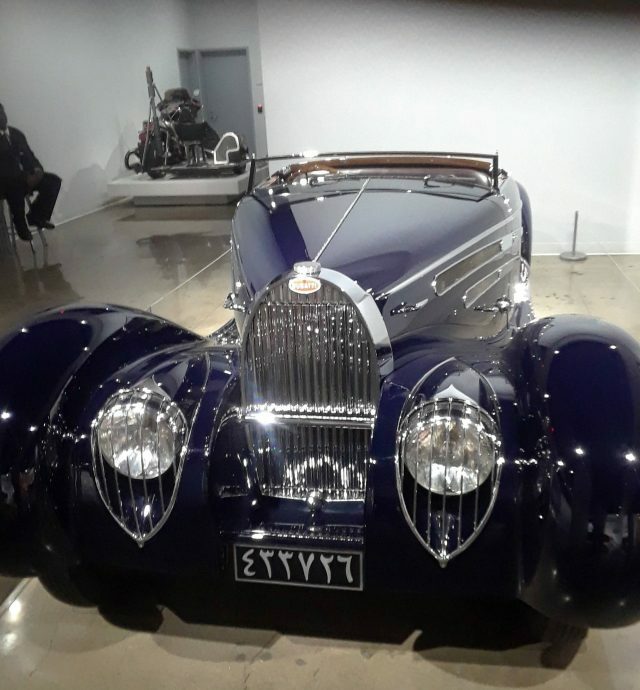 The museum is filled with amazing automobiles. There are three floors of cars, and the place is filled with schoolkids who come to see this wonderful place. 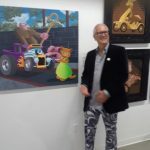 There is a special exhibit currently on the ground floor called “Inside the Auto-Didactic: The Juxtapoz School Exhibit,” a collection of Lowbrow/Kustom Kulture art. 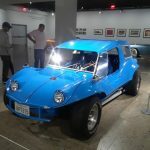 This show was curated by the big muckity-mucks at the Peterson Museum, fresh off a lowrider show. 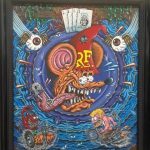 Kustom Kulture is our favorite art movement–born to hot rod comic books that mated with Surrealism, with a little help from Ed “Big Daddy” Roth, L.A. artist Anthony Ausgang, and Robert Williams, who created Juxtapoz magazine. Williams’ magazine provided a platform for artists that the fine art community had considered “lowbrow” due to their style and choice of subject, like hot rods, skateboarding, and monsters. After viewing the exhibit, we recommend having lunch at Drago, a swank restaurant in the Peterson. Make sure to order the delicious Mango Raspberry Sorbet! By the time we all bid each other goodbye the rain was gone, making it, and us, quite sunny. 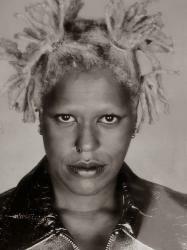 “Inside the Auto-Didactic: The Juxtapoz School Exhibit” at the Peterson will run through June of 2019 in the Armand Hammer Foundation Gallery. The exhibition is included with the purchase of a general admission ticket. SPOT ON! Its a great show f-f-folks! And that’s not all!